Topics: Content Highlights, Subscriptions, Westlaw Ie Teams, and Brochures & Guides. It is hosted by Telecitygroup International Limited (England, London,) using Apache/2 web server. 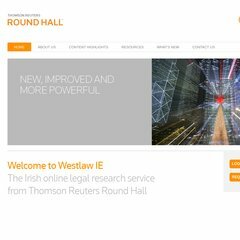 Westlaw.ie's IP address is 213.219.34.185. Its 2 nameservers are ns11.westgroup.net, and ns12.westgroup.net. The server is faster than 99% of measured websites, at 196 milliseconds.